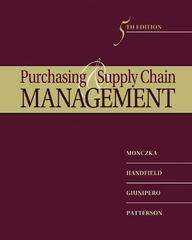 Purchasing and Supply Chain Management 5 Edition Gain a thorough understanding of the critical role of purchasing in the supply chain with one of today's leading-edge strategy and purchasing books--PURCHASING AND SUPPLY CHAIN MANAGEMENT, 5E. This turnkey solution provides current and complete coverage that makes it not only a useful book, but also a valuable professional reference tool. This edition presents the most recent critical developments in the field as well as the impact of the recent recession and ongoing business uncertainty on today's supply chain. This leading author team draws from firsthand experience and their relationships with executives and practitioners worldwide to present numerous cases, memorable examples, and unique insights that enable readers to better understand today's purchasing process.